Beauty may be in the eye of the beholder, but love was in the heart of young Chantal Kirkby when she came across Butch. Butch came into care at the Animal Protection Society in Perth a little worse for wear. He had a broken leg and a face that bore the scars of scuffles with his previous owner’s other dog. But this didn’t deter Chantal, who wanted big, boofy Butch to know what it was to be loved. 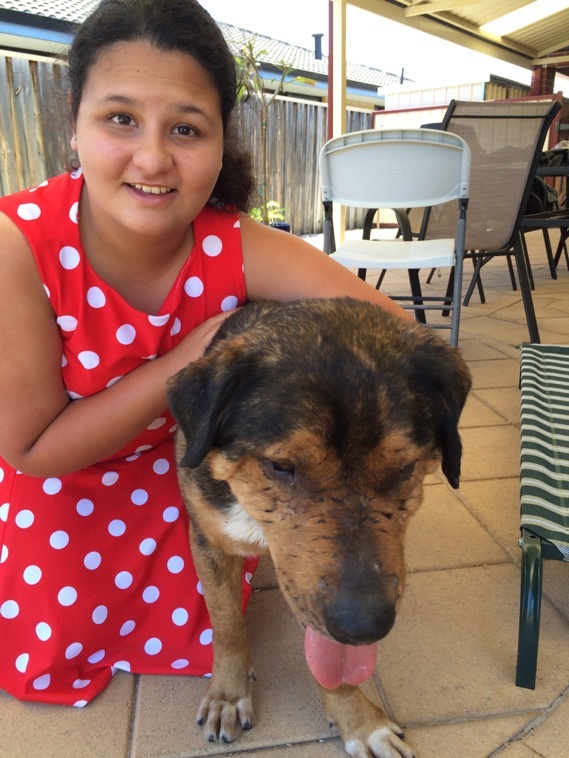 Chantal, 13, thought Butch would find it harder to find a home than the younger, cuter puppies and dogs and opened her heart to this gorgeous boy. Chantal’s father Bruce said once Butch was home and settled in, his daughter even wanted to enter Butch in a dog show. ”She saw him as something beautiful,” Bruce said. “We believe every dog deserves a second chance, and we wanted to give him that chance. He’s settled in really well, and we couldn’t have asked for a better dog. Bruce said his daughter was itching to work at an animal shelter. It will be a few years before Chantal is old enough, but until then she’ll have plenty of time to work on loving Butch. You can create a future where ALL homeless pets are as lucky in love as Butch. For as little as $10 a month, you can give Australia’s homeless pets the very best chance of finding a loving forever home. Start making a difference today by signing up to give monthly!